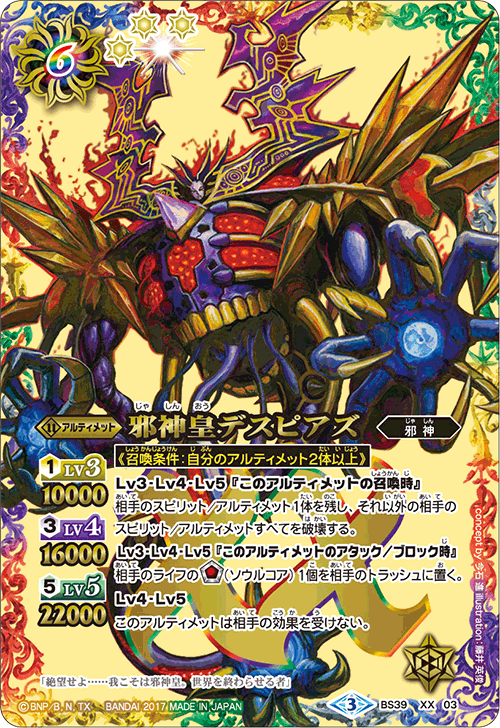 A super-powerful dark lord that descends onto an Ultimate! 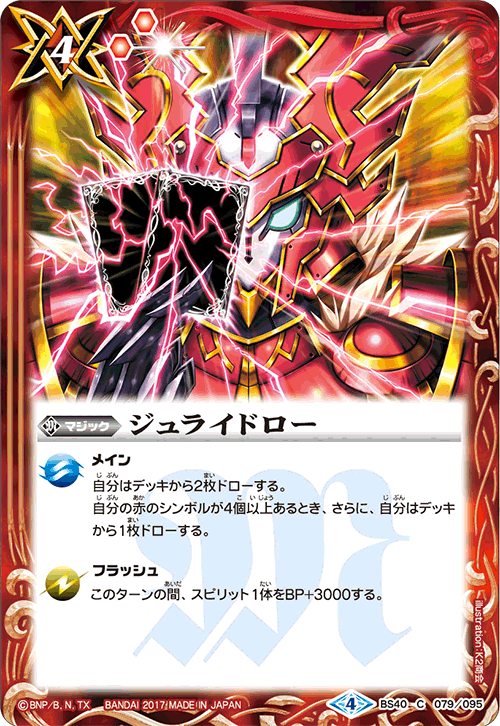 Its effects are more than worth the effort of playing the card. 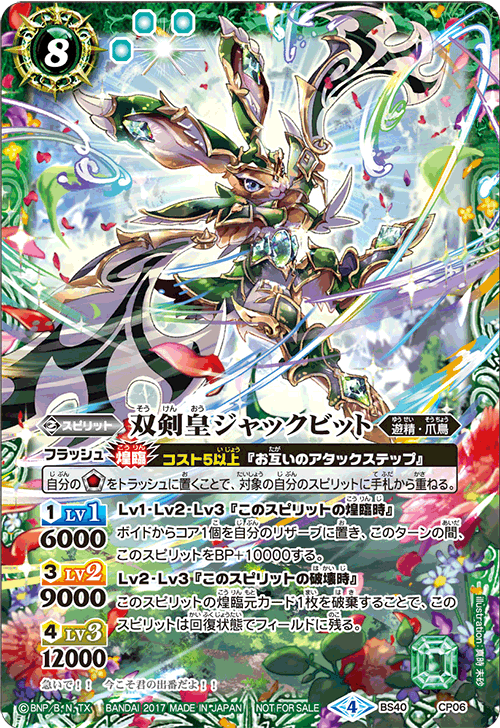 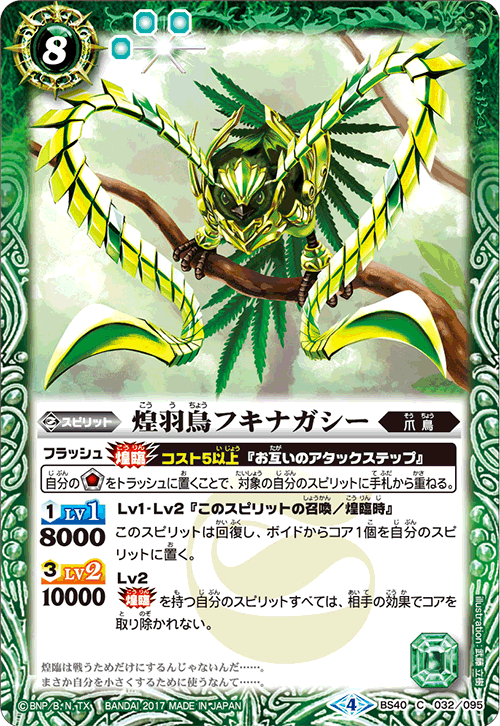 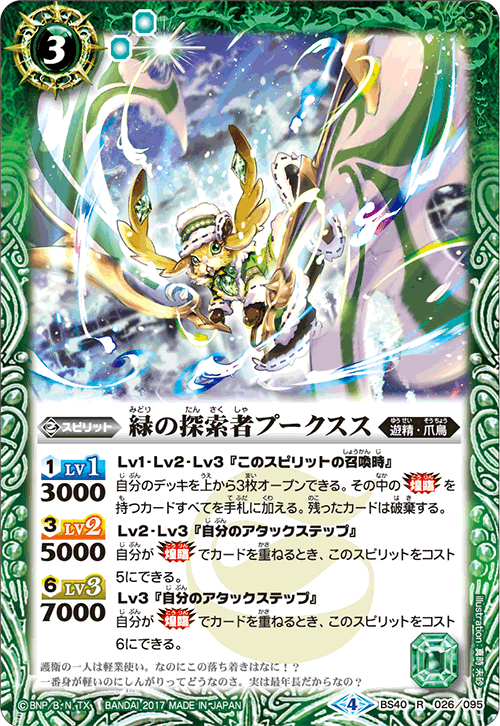 Especially, the [Seal] prohibition gained by descending on “Death Piaz”is a relentless effect that may end the game depending on the opponent’s deck. 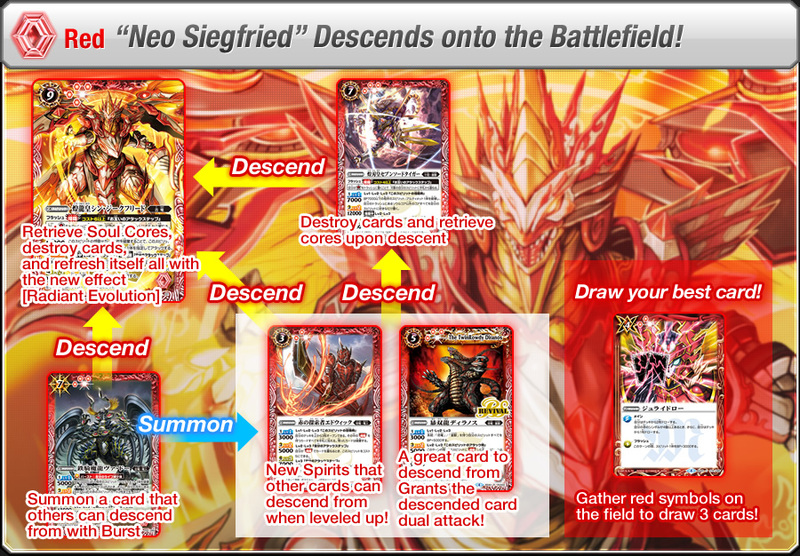 Try building a specialized deck and experience the overwhelming power. 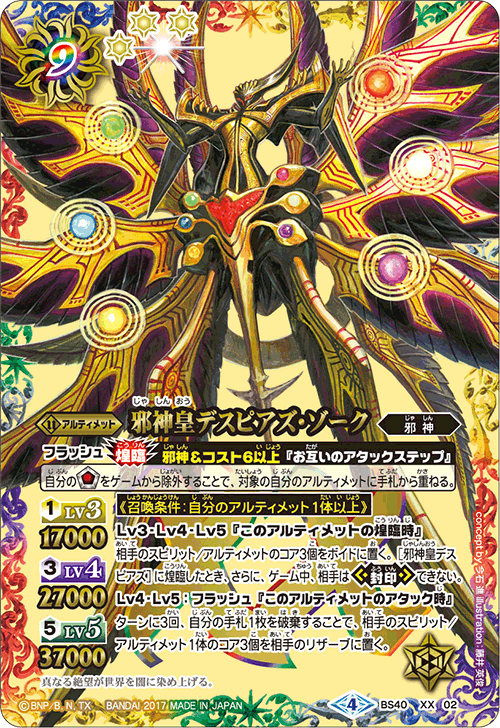 Promotional cards in each color, featuring basically the same abilities. 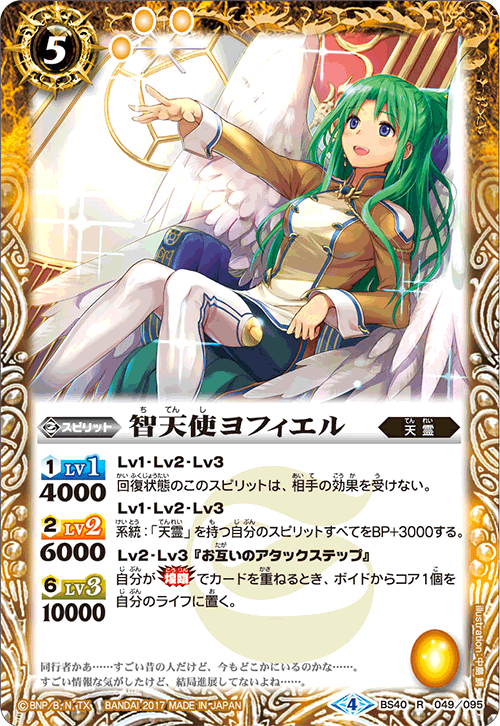 They make great utility cards with basic abilities and effects to increase cores when descended. 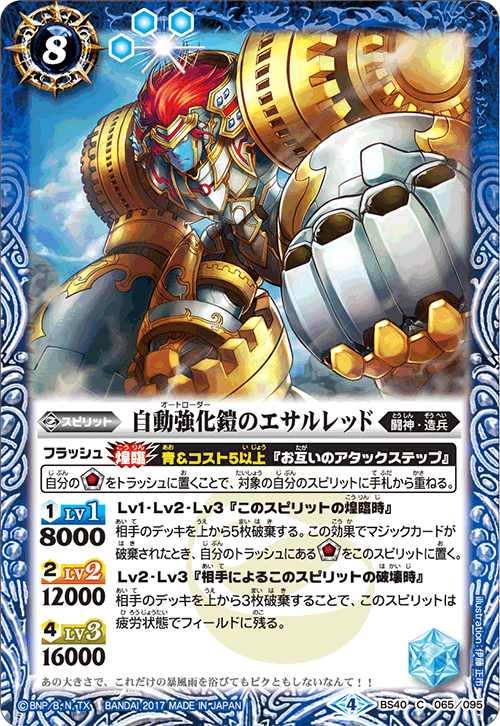 Use them well to counter your deck’s weaknesses. 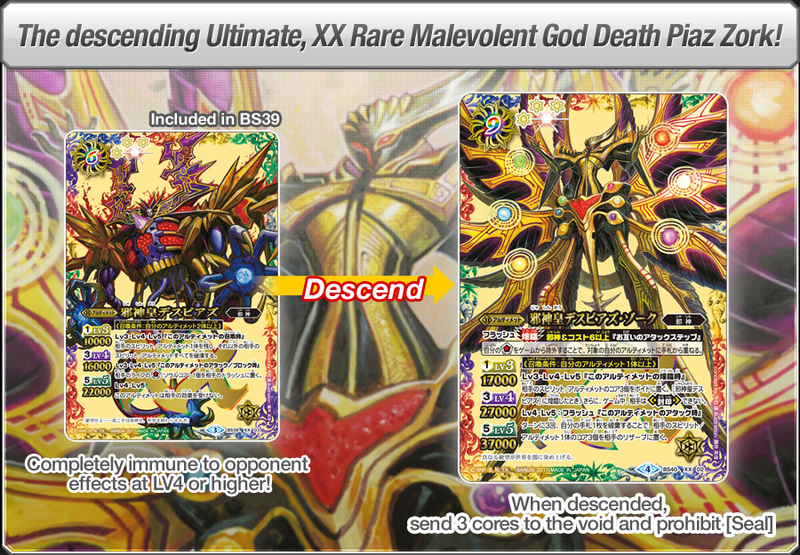 They make great utility cards since the only conditions for Radiant Descent is card cost, and they have effects to draw cards when descended. 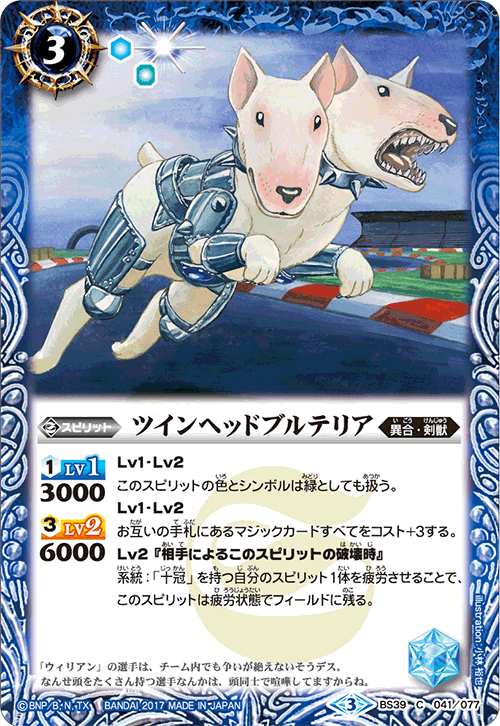 These cards are very useful for fine-tuning your deck! 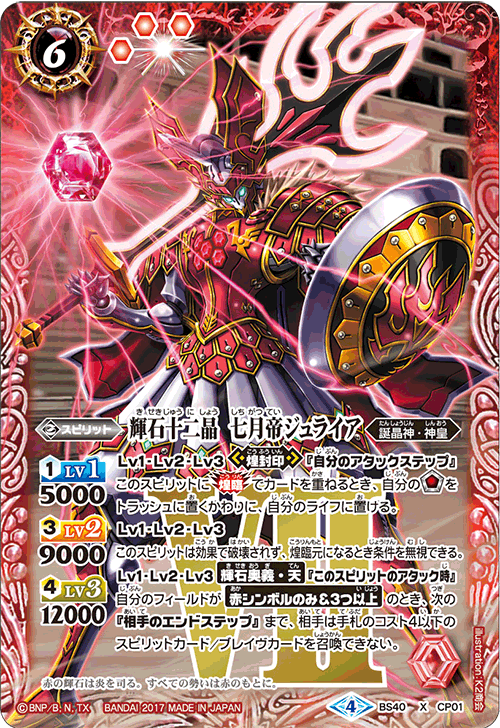 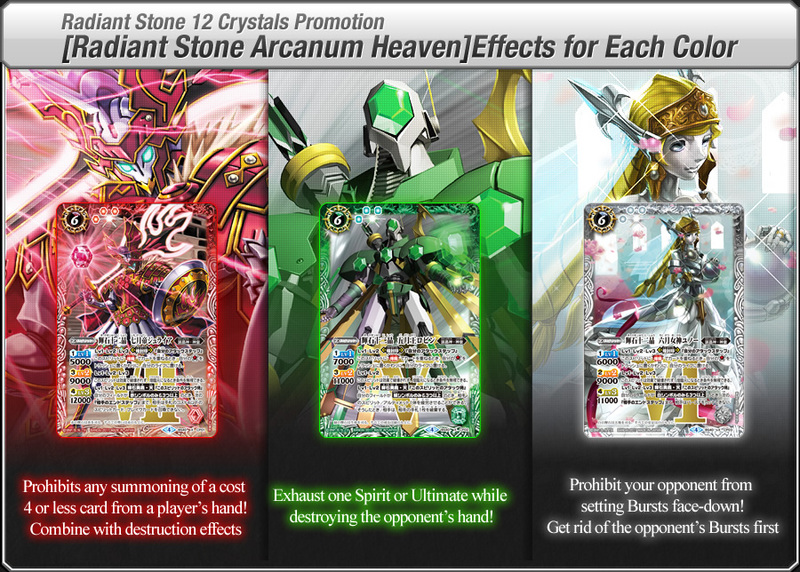 [Radiant Stone Arcanum Heaven] activates by only having a single color of symbols on the field while having 3 or more of them. 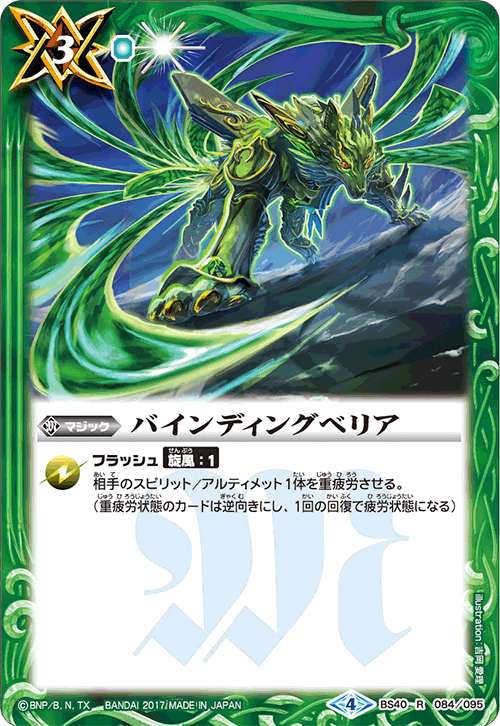 The effect differs by color, strongly reflecting the strategies of the corresponding color, thus making them great additions to any deck. 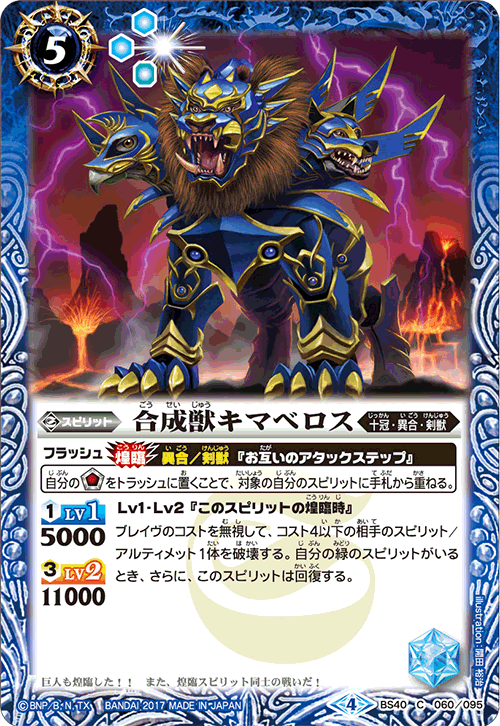 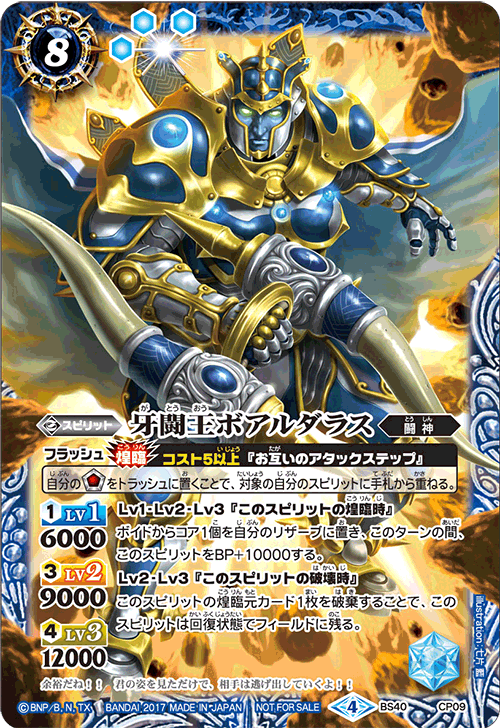 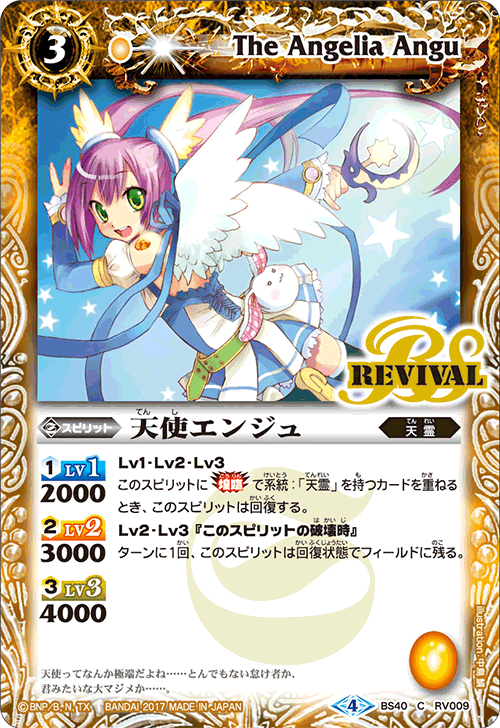 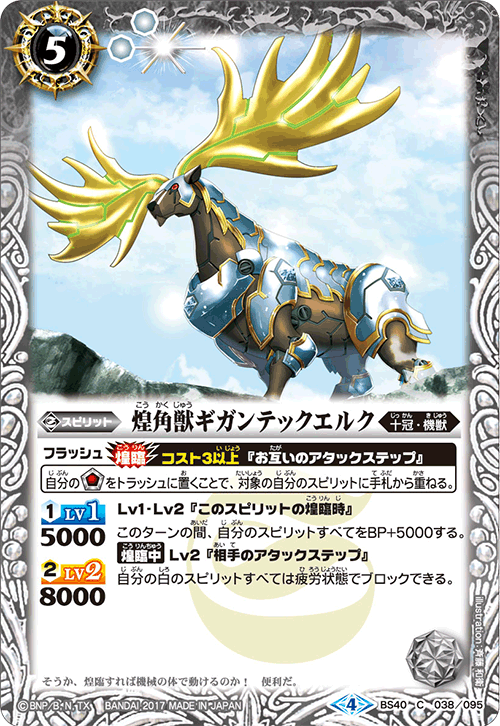 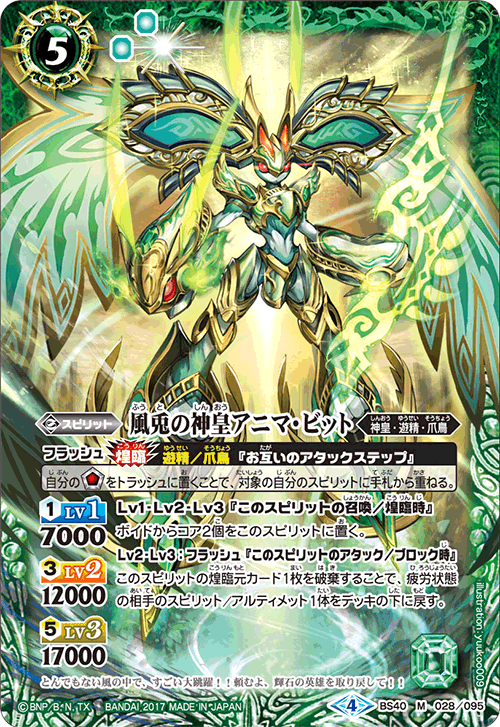 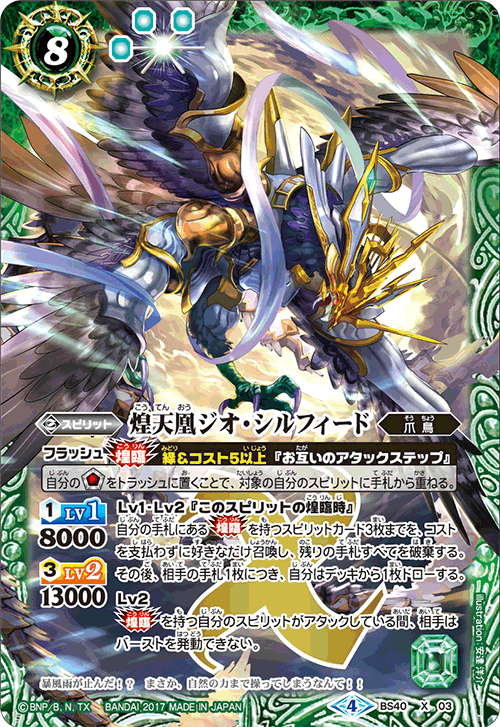 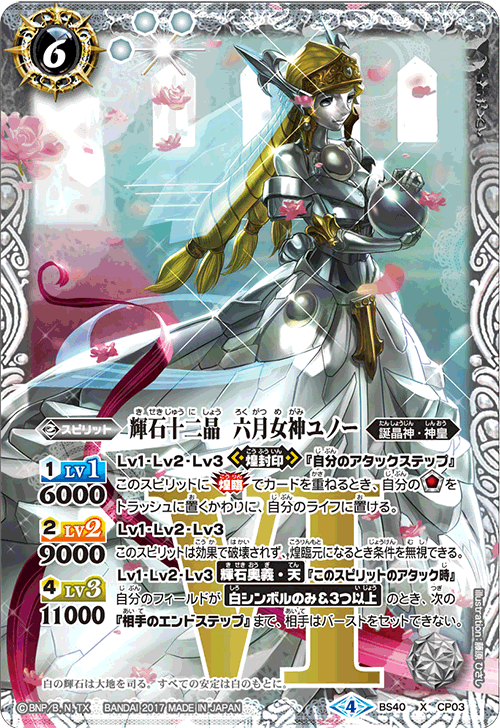 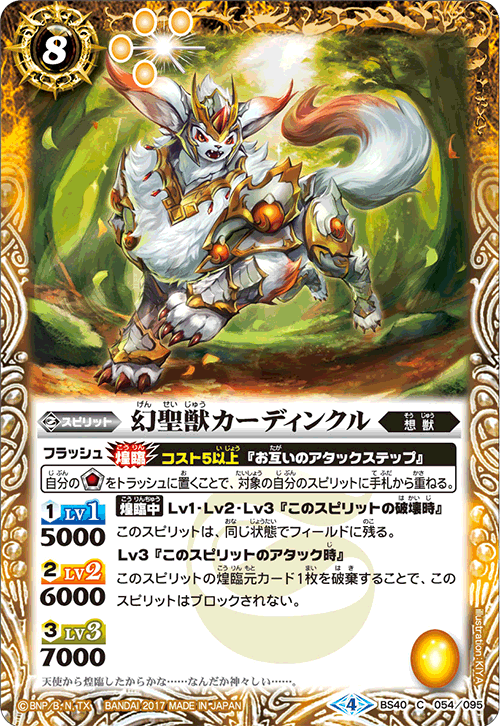 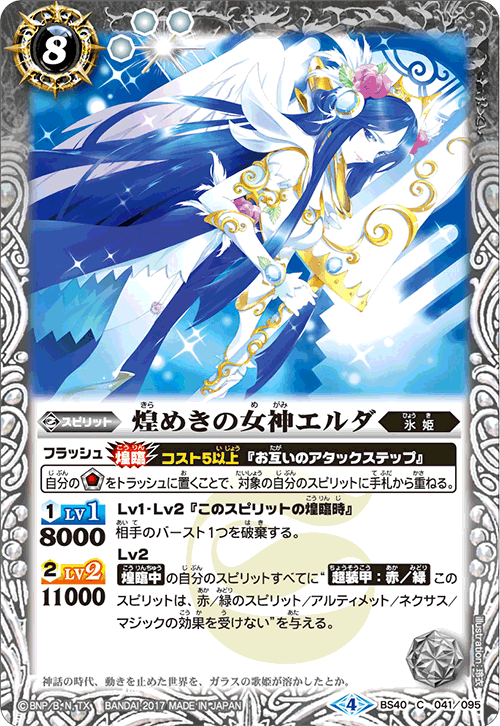 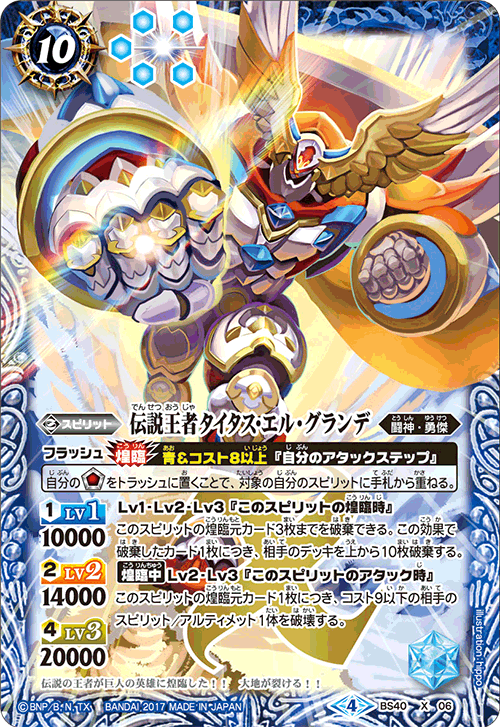 Don’t miss their common [Radiant Seal] and effects enabling any card to descend on them ignoring conditions. 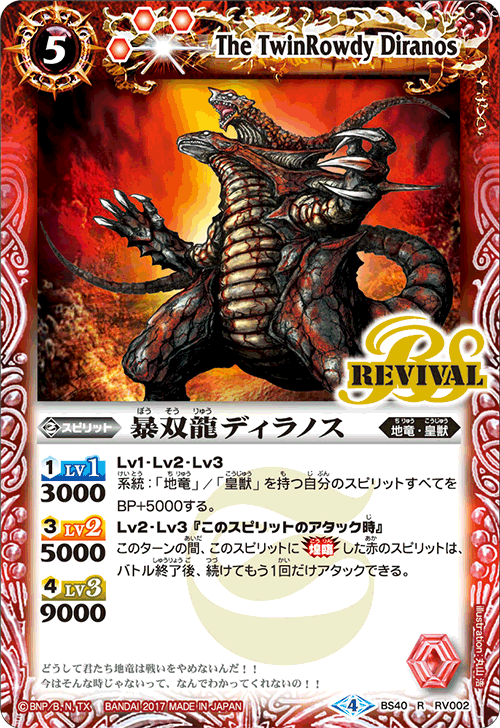 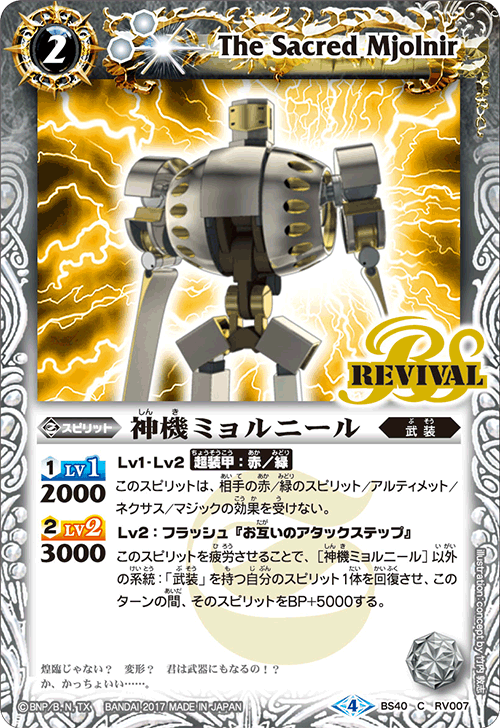 There is no doubt these cards will have a strong presence throughout the series with these effects. 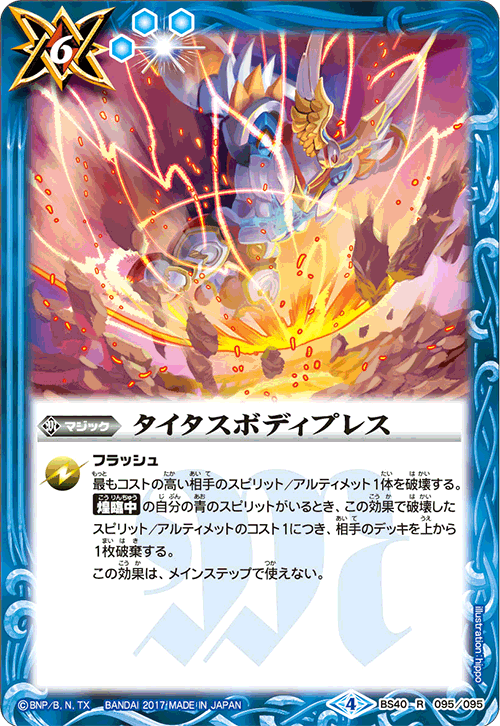 However, the effect unleashed when it descends is devastating! 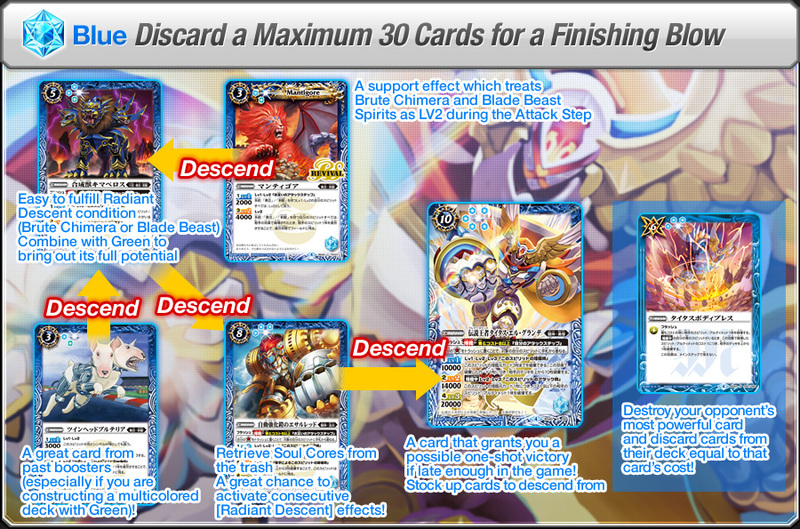 You can discard up to 3 cards it descended from to discard 10 cards for each of those cards from the opponent deck! 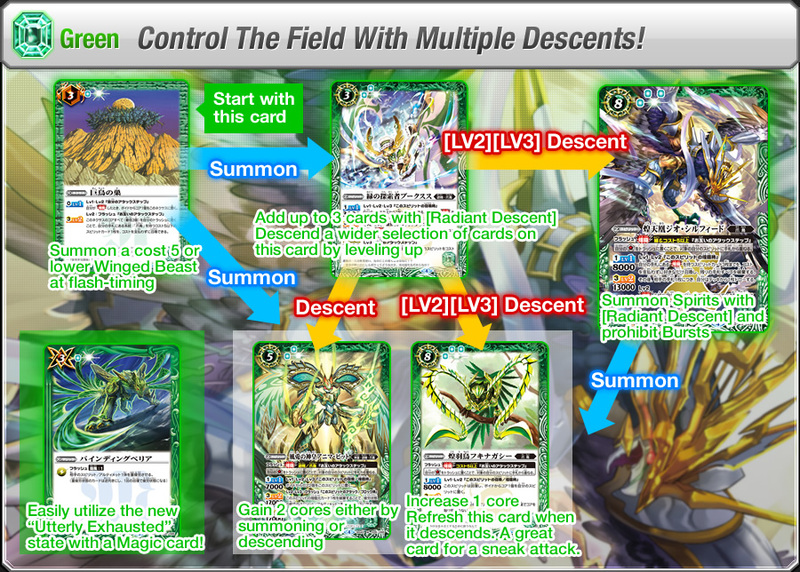 Always keep an on eye on the number of cards left in your opponent’s deck. 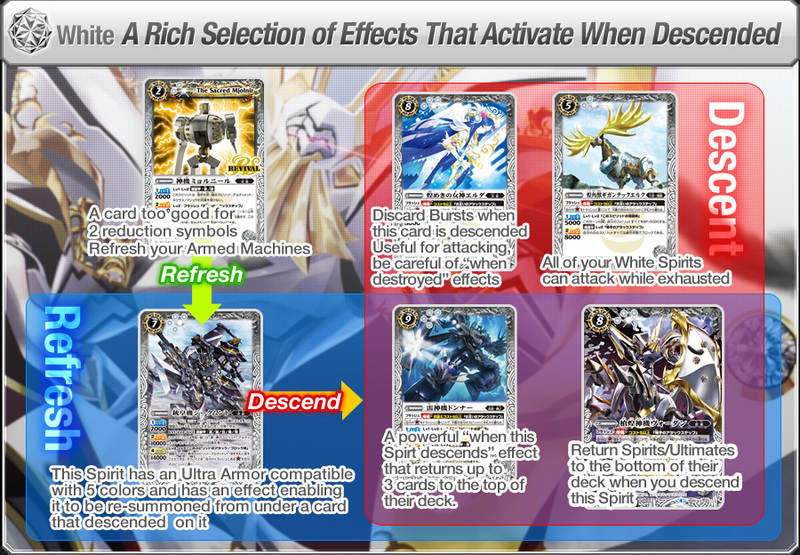 Don’t miss a chance to blow them away! 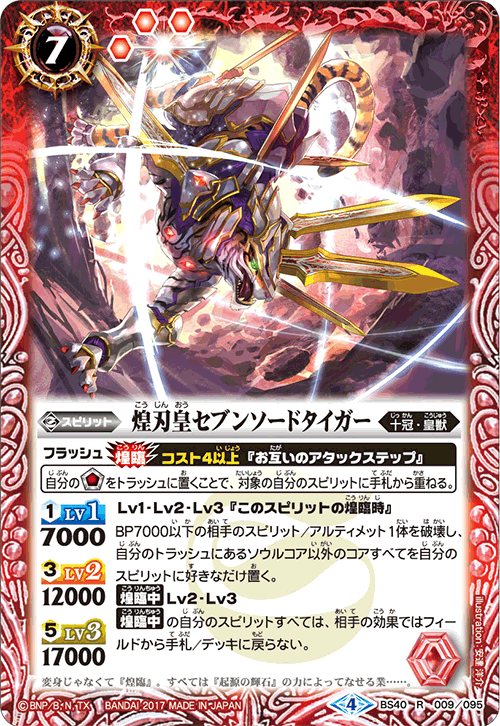 By sustaining “Yofiel” on the field, you can gain life every turn. 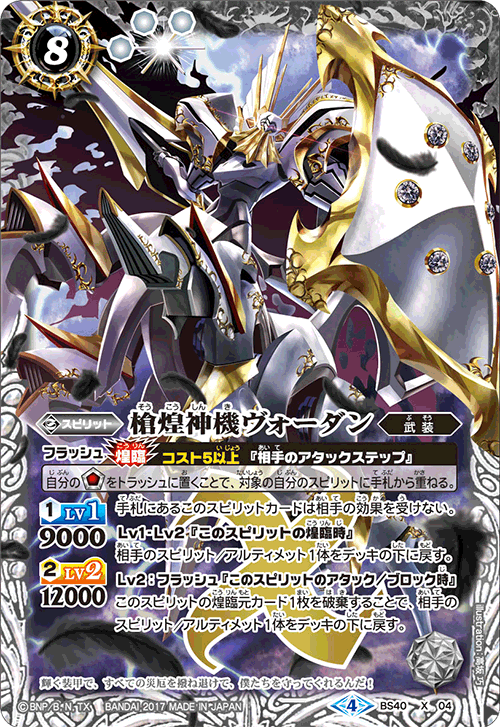 Go on the offensive once you are ready to play “Araphiel”! 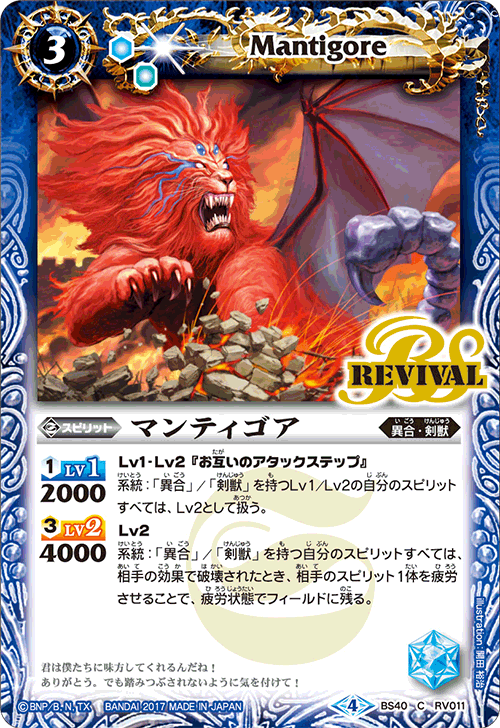 Return all cards except Braves to the bottom of the deck. 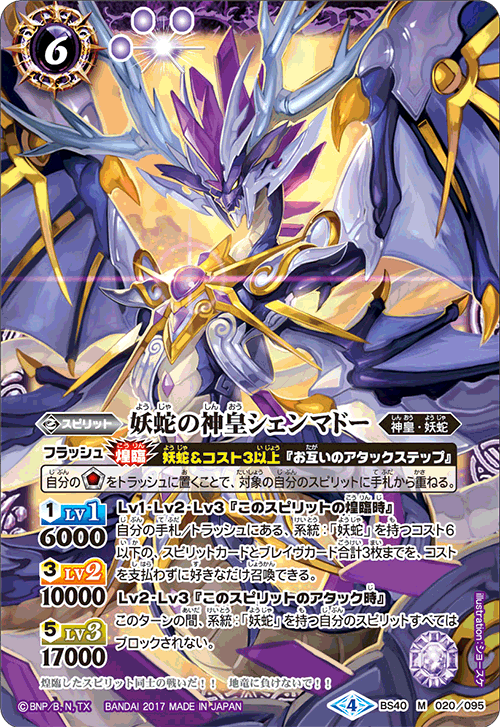 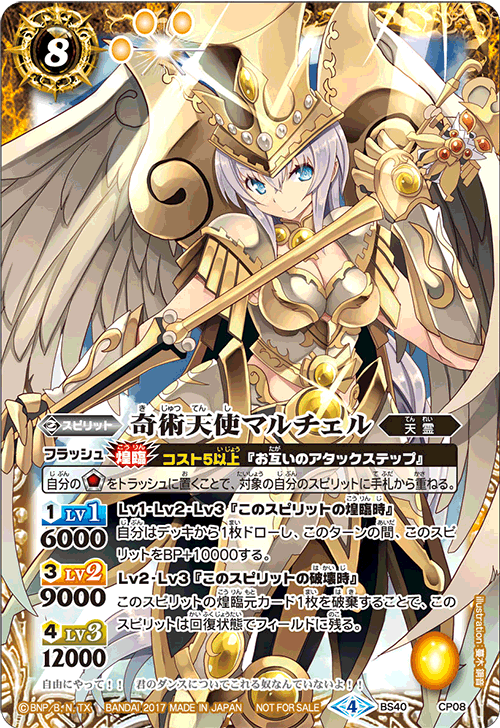 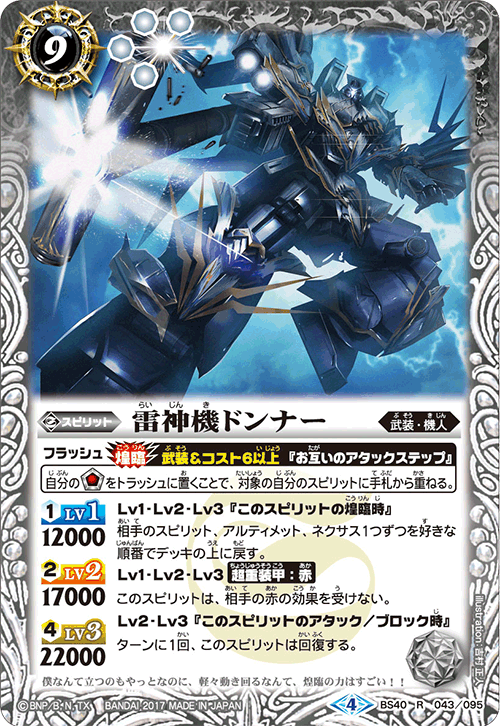 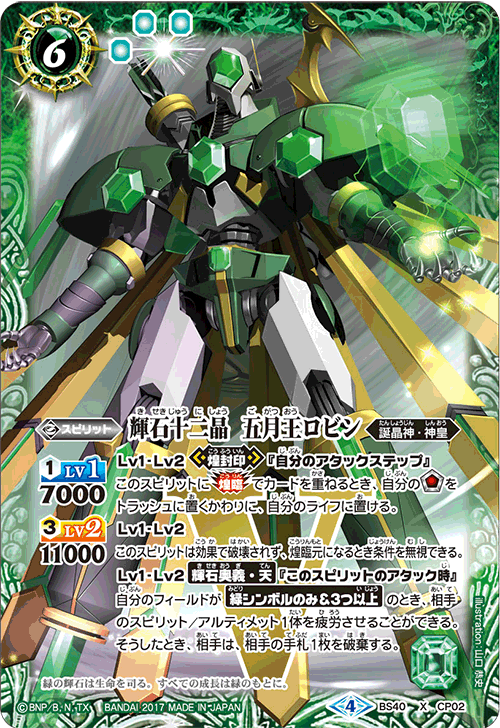 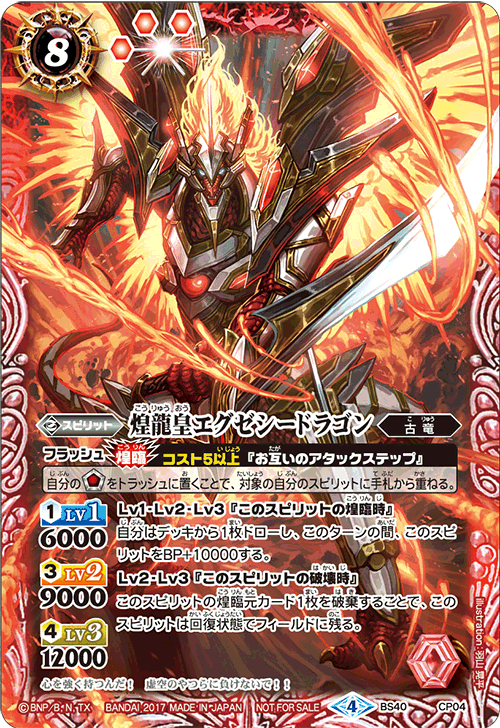 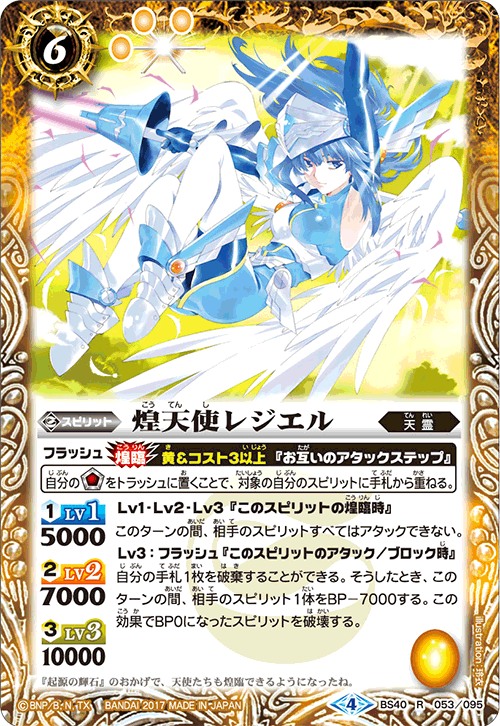 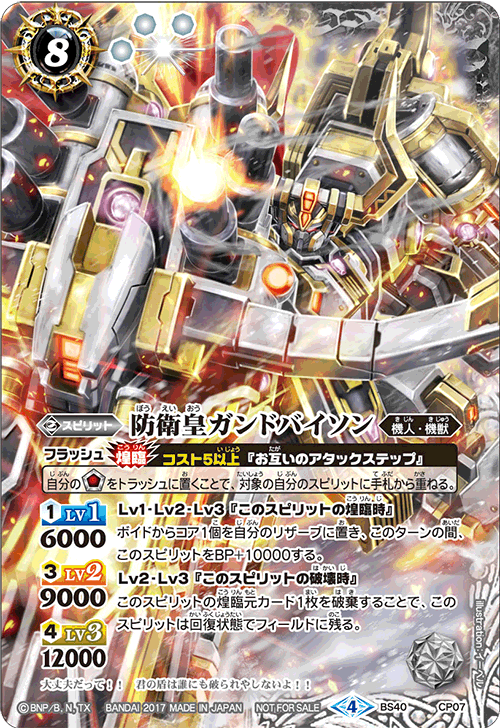 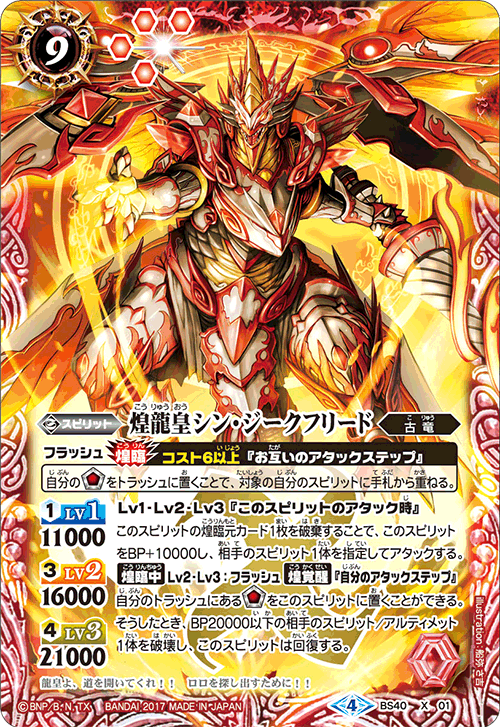 If “Araphiel” has 3 cards it descended from, you can actually use both its “when this Spirt descends” and “during descent” effects. 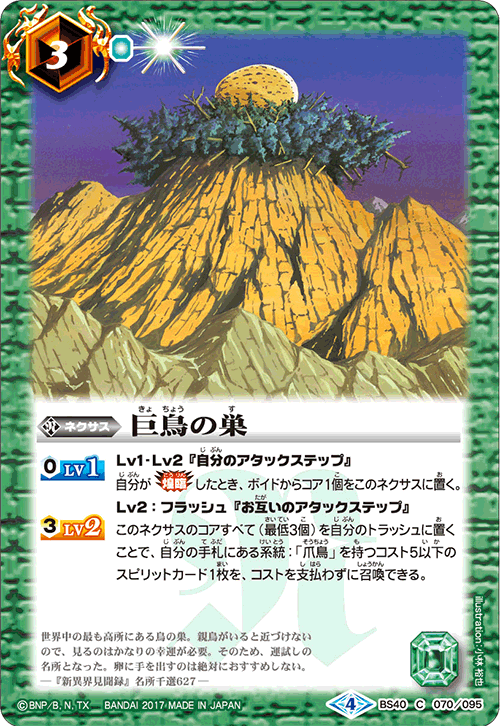 You can return one opposing Spirit/Ultimate to the bottom of their deck just by descending “Vordan”. 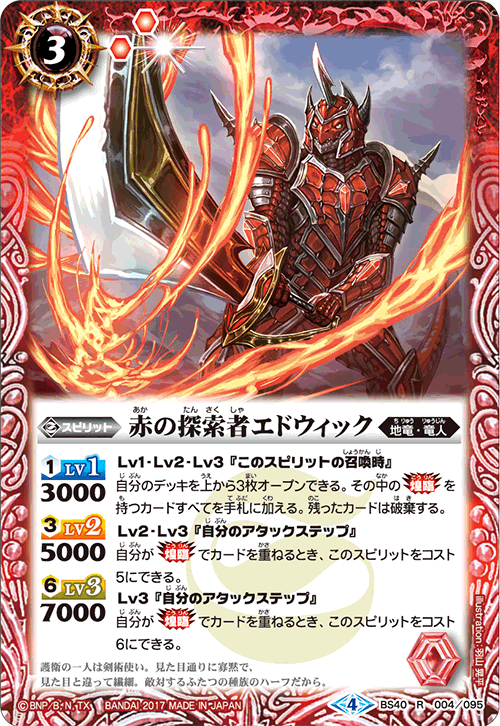 The condition (cost 5 or higher) is loose, so you can easily add the card in other-colored decks. 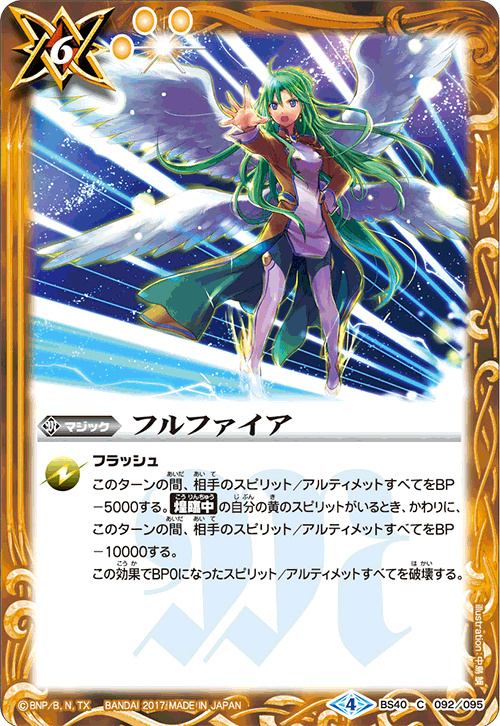 Don’t miss ”Eda”’s powerful “when this Spirt descends” effect either, which discards Bursts. 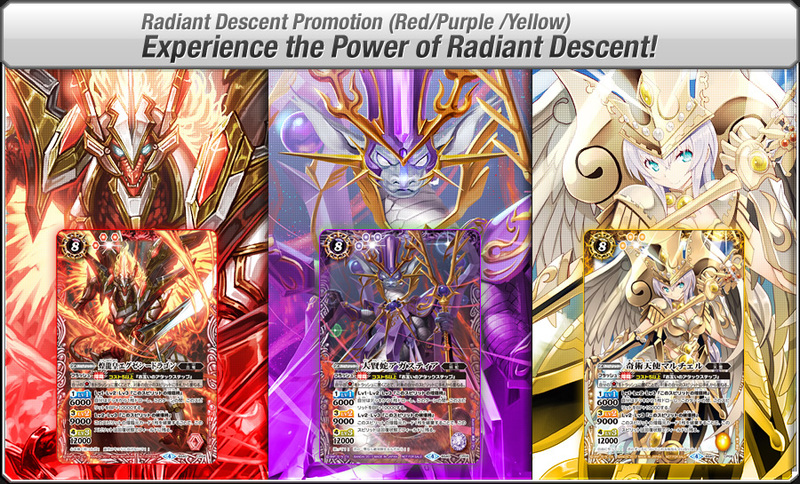 By descending “Geo Silfeed”, summon up to 3 Spirits with Radiant Descent from your hand without paying their cost! 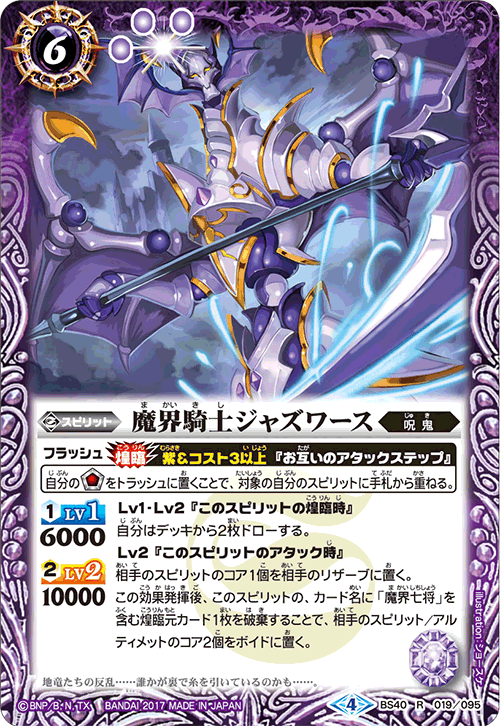 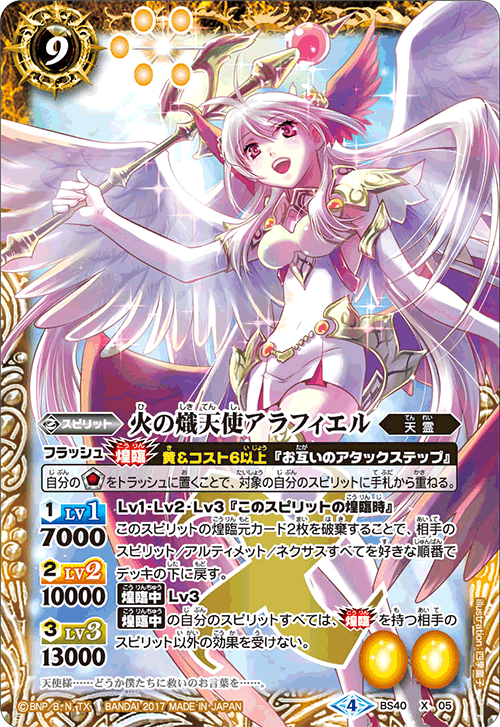 With no worry of such Spirits flooding your hand, you can construct your deck with a large number of Spirits with [Radiant Descent]. 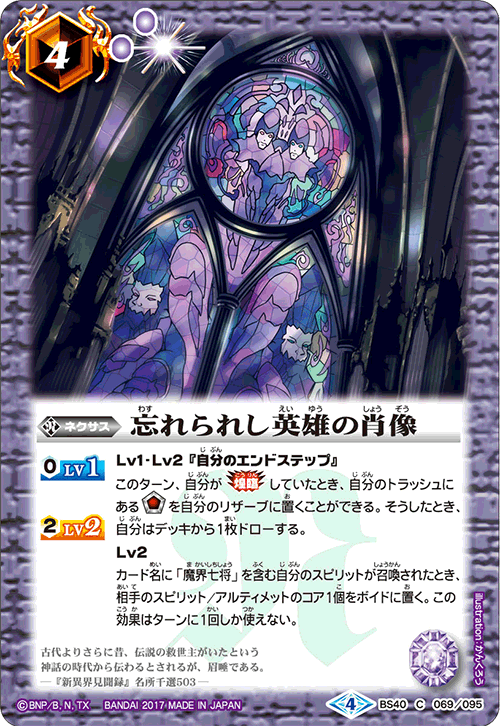 Works especially well with Spirits that have “When this Spirit is summoned” effects! 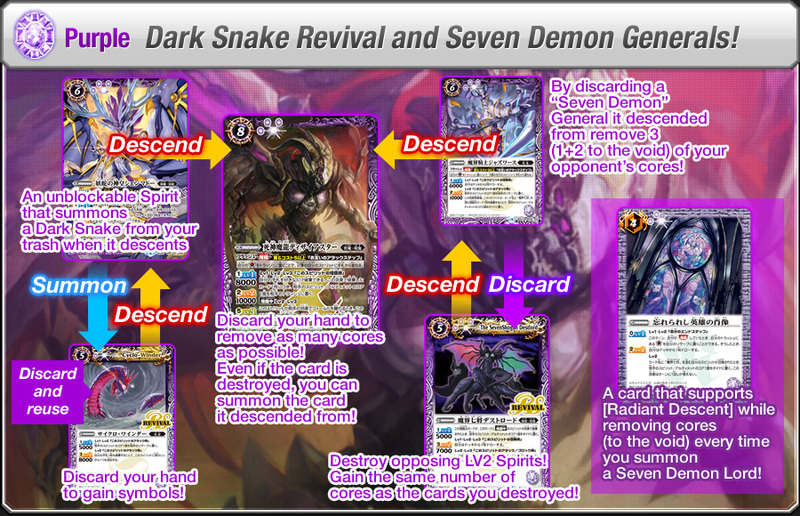 Purple can adapt various strategies according to the Spirit with [Radiant Descent] you decide to build around. 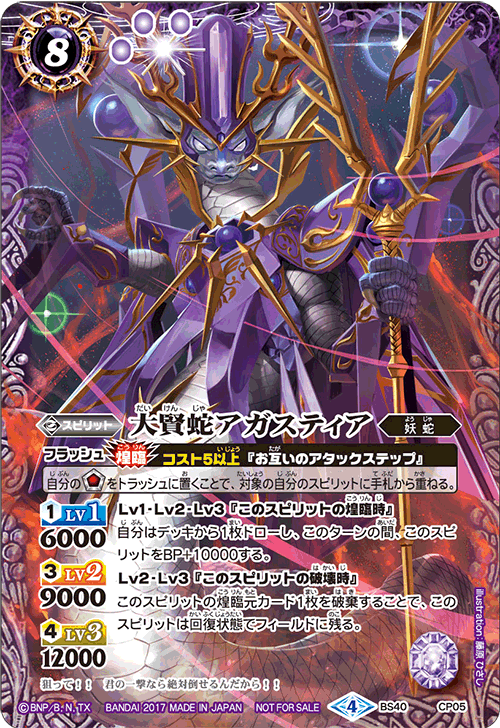 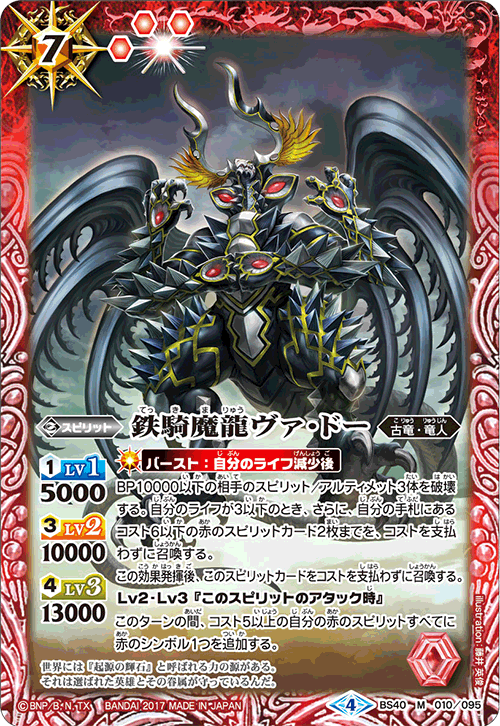 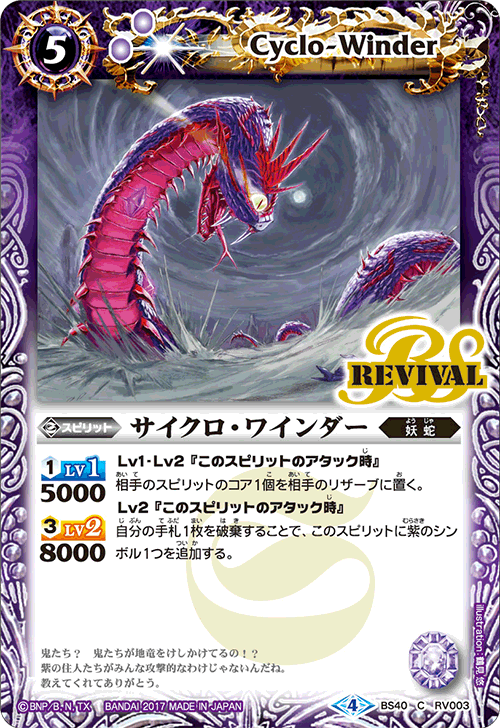 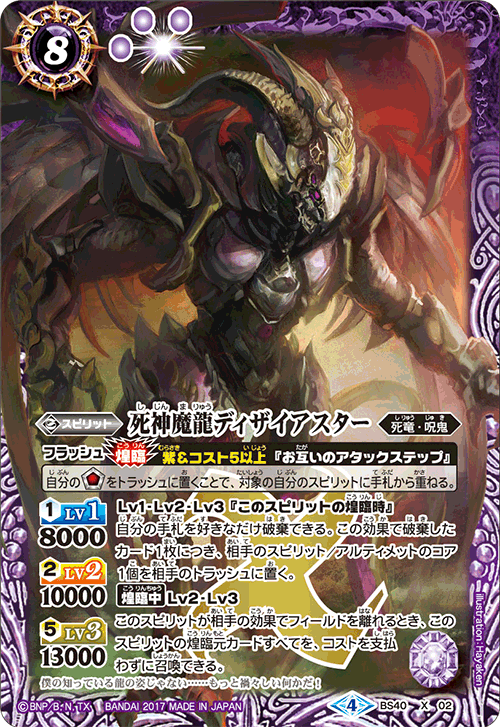 Lead an army of Dark Snake Spirits with ” Shenmadoo,” or remove cores with a “Jazworse” and “Destlord” Seven Demon General deck. 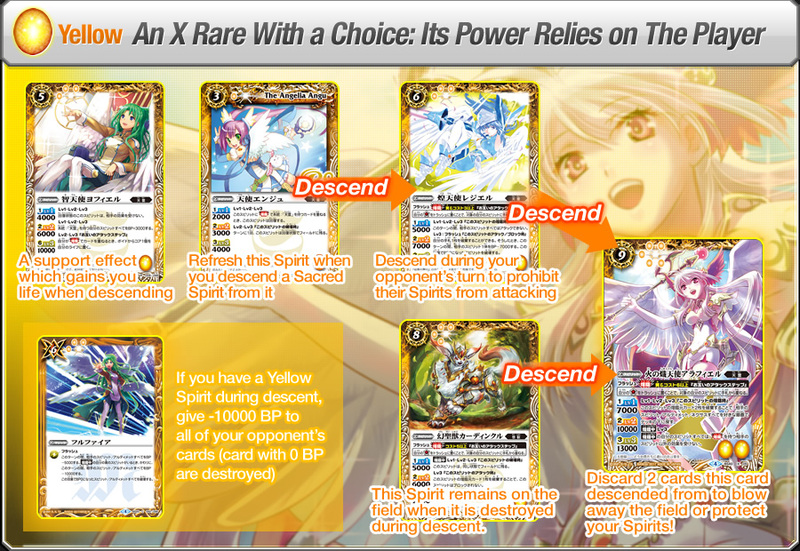 If you descend “Desire Star” on your descended Spirit, it will return to your control even if “Desire Star” is destroyed. 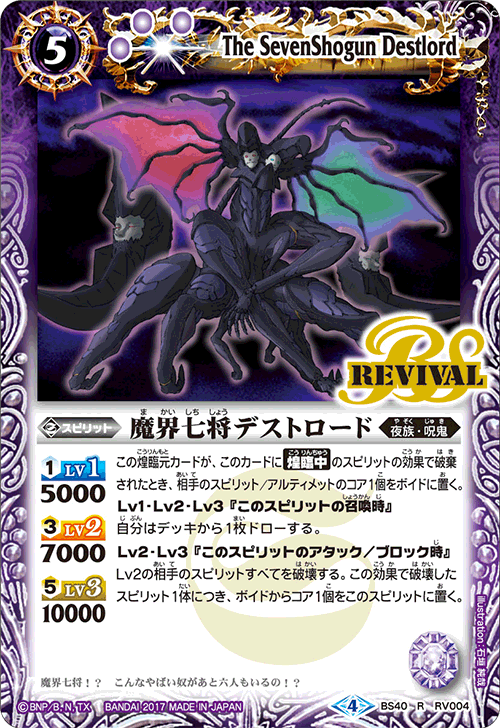 Retrieve Soul Cores from the trash, and then destroy an opposing Spirit/Ultimate with 20000 BP or less. 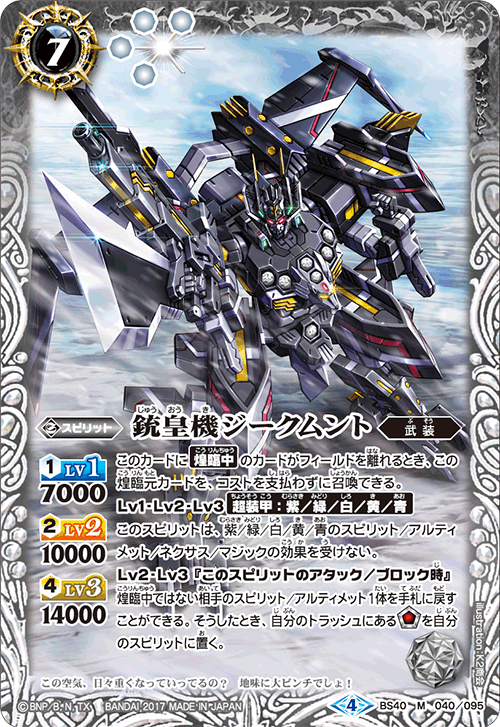 It even refreshes itself afterward. 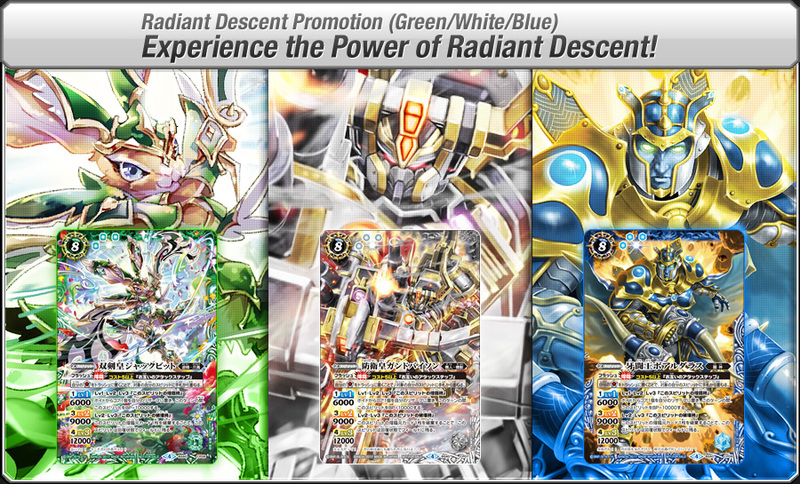 Use the retrieved cores to activate consecutive [Radiant Descent] effects.